The low-temperature solid-state control equipment recently produced by GN Solids Control is sold to Uzbekistan for use in the severe cold area. The low-temperature solid-state control equipment used in the Uzbekistan site is required to meet the ambient temperature of -50C degrees Celsius. After our technicians, business managers and customers The communication provider finally ordered our low temperature solid control equipment. The low-temperature solid-control equipment produced by Guanneng can produce a variety of models according to the actual application volume of the on-site customers. The low-temperature solid-control equipment produced by our company has high-efficiency separation ability on site, and the solid control equipment produced by GN Solids Control is widely used. 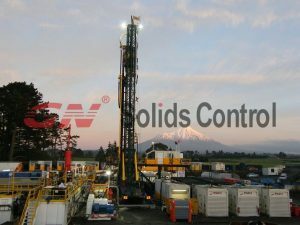 In oil drilling, coalbed methane development, horizontal wells, non-excavation directional drilling rigs, pile drivers, shield mud recovery and other fields. 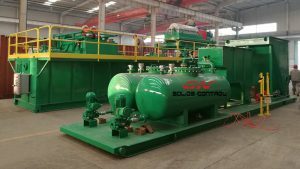 The low temperature solid control equipment ordered by the customer mainly includes drilling fluid centrifuge, drilling fluid vibrating screen, drilling fluid slurry cleaner and drilling fluid vacuum deaerator. The drilling fluid centrifuge is designed for the characteristics of petroleum drilling fluid. Special equipment for solid-liquid separation can complete various processes such as feeding, centrifugal sedimentation and unloading at full speed. The drilling fluid vibrating screen box is made of stainless steel. The motor has high vibration intensity, large screening area, adjustable screen box angle, enhanced shock absorption measures and low working noise. It is the most important first-level solid-control separation equipment in drilling operations. The drilling fluid mud cleaner cyclone adopts pure polyurethane material, the sieve box is made of stainless steel, and the motor and electric control are all internationally famous explosion-proof brands. The drilling fluid vacuum degasser is a solid control device for treating gas infiltrating drilling fluids, which can quickly remove various gases intruding into the drilling fluid, and plays an important role in restoring the specific gravity of the mud and stabilizing the performance of the mud. The GND series is a mud recovery system designed for micro tunnels and piling. Recently at GN’s China headquarters, a complete mud recovery system has just been completed and shipped to domestic customers in China. 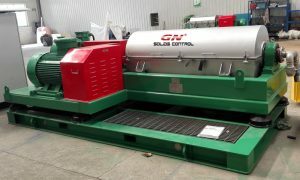 GN Solids Control is the world’s leading manufacturer of solids control equipment and mud recovery systems. 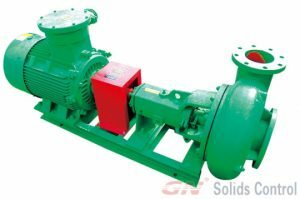 As a leading manufacturer of shale shakers, mud cleaners, decanter centrifuges, cutting dryers, centrifugal pumps, etc., GN’s brands and products are available. More and more international customers are recognized. The GND system consists of a two-layer mud shaker, two hydrocyclones, a centrifugal pump, a tank and an electrical control system. The system can effectively separate solids and liquids, reduce the solid waste content in the drilling mud, make the cuttings drier, easy to transport, environmentally friendly and easy to handle. The entire system is very compact and armored, very economical and value for money. The first stage separation of the system is a two-layer mud vibrating screen. When the mud enters the lower layer of the screen, large solids will be separated from the mud. Fine solids and mud will fall into the tank, and the mud will pass through the centrifuge. The pump draws in two hydrocyclones that work like a sand remover to separate the solids size to 40 microns. The solids separated by the hydrocyclone will fall onto the upper deck of the shale shaker and the solids will be further dried for disposal. The clean mud separated by the hydrocyclone will fly back to the tank and be pumped back to the wellbore for reuse and recycling. The basic configuration of the mud recovery system is a two-layer mud shaker, two hydrocyclones for sand removal, a centrifugal pump, a mud tank and some other components. Visit our website at www.gnsolidsamerica.com for more information, please send your questions to USA@gnsolidscontrol.com. Recently, we forced our key staff to push our Decant centrifuges to the North American market. So far, we have received a lot of good feedback from different end users in the US and Canada. Our decanter centrifuge system is suitable for many different environments. They can work in a super hot desert environment. The VFD control system is provided by SIEMENS or ABB. All bearings used in the centrifuge are made of SFK quality bearings to ensure longer life and more reliable operation. All motors and control panels are explosion-proof and certified for use in Zone 1 and Zone 2 hazardous areas. The 553 decanter centrifuge will be a star product for handling large volumes of liquid and solids separation work. More and more customers are showing great interest in this. Also for many different industries, they also chose our decanter centrifuge as the first choice for solids separation. Now GN can not only manufacture the traditional 363 centrifuge with a 14-inch bowl, but also make a larger bowl size GNLW553 with a bowl size of 22 inches. The equipment can be used to process water-based mud, oil-based mud systems, dewatering and recovery of barite. This device also has some great features: it is VFD controlled and offers operators a variety of solutions to adapt to changing field operations. 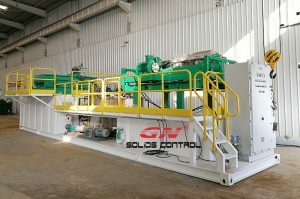 GN Solids Control is the world’s leading manufacturer of solids control equipment and mud recovery systems. As a leading manufacturer of shale shakers, mud cleaners, decanter centrifuges, cutting dryers, centrifugal pumps, etc., GN’s brands and products are available. More and more international customers are recognized. The ND system consists of a two-layer mud shaker, two hydrocyclones, a centrifugal pump, a tank and an electrical control system. The system can effectively separate solids and liquids, reduce the solid waste content in the drilling mud, make the cuttings drier, easy to transport, environmentally friendly and easy to handle. The entire system is very compact and armored, very economical and value for money. The first stage separation of the system is a two-layer mud vibrating screen. When the mud enters the lower layer of the screen, large solids will be separated from the mud. Fine solids and mud will fall into the tank, and the mud will pass through the centrifuge. The pump draws in two hydrocyclones that work like a sand remover to separate the solids size to 40 microns. The solids separated by the hydrocyclone will fall onto the upper deck of the shale shaker and the solids will be further dried for disposal. The clean mud separated by the hydrocyclone will fly back to the tank and be pumped back to the wellbore for reuse and recycling. The basic configuration of the mud recovery system is a two-layer mud shaker, two hydrocyclones for sand removal, a centrifugal pump, a mud tank and some other components. Visit our website at www.gnsolidsamerica.com for more information, please send your questions to USA@gnsolidscontrol.com.